Call & Message Blocking is a temporary add-on that lasts 90 days then has to be reapplied. It can also be managed via the My Verizon app. For a permanent solution, you can subscribe to the Verizon Smart Family™ service. From a website, sign in to My Verizon. From the My Verizon Home screen, navigate: Plan > Blocks. 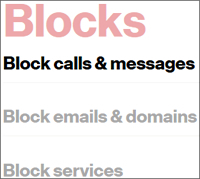 Click Block calls & messages. If needed, select a specific device on the account. If subscribed to Verizon Smart Family, refer to Add or Remove a Blocked Call or Contact. Enter the 10-digit phone number(s) you wish to block then click Save. Only 5 phone numbers can be blocked. Incoming calls from blocked numbers are automatically sent to voicemail.